L-series engine mods for road racing, drag racing, off-road racing & improved street performance. Covers 510, 610, 710, 810, 200SX, 240Z, 260Z, 280Z, 280ZX and pick-up truck engines. Frank Honsowetz, Nissan/Datsun racer, tells how to choose L-series engine parts, prepare and assemble them for optimum power and durability. Lubrication, ignition and exhaust systems are covered in detail. Bonus section covers how to choose, tune and maintain Mikuni/Solex, DCOE Weber and SU carburetors. 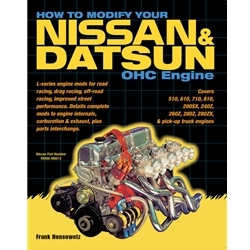 All aspects of modifying the Nissan/Datsun L-series engines are covered.